Seven months without a coach, India's table-tennis players are without camps and are even managing tournament costs and logistics a year before Tokyo 2020. G Sathiyan has come a long way in the world of table tennis, with even the top players now taking him more seriously. It gives him confidence that he is much better than his current ranking of 28 suggests. Top-ranked Indian Sathiyan Gnanasekaran qualified for the World Cup after upsetting world No. 14 Chun Ting Wong of Hong Kong at the Asian Cup in Yokohama. After winning the 2019 national championships, trouncing Manika Batra en-route, Archana Kamath is all set to take on the senior World Tour. Adriana Diaz owns several goals and winning gold on the world's stage is one of them. "Like every athlete, I want to medal at the Olympics. If I stay focused -- I'll get there." Commonwealth Games, Asian Games, the football and hockey World Cups -- we have seen some brilliant sporting action across 2018. Here's ESPN India's top content of the year. Sathiyan Gnanasekaran's experiments with his equipment paid off this week in Austria, and he is already looking to continue improving his game. Yuka Saso hobbled with a four-over-par 74 on Wednesday but still remained in the hunt for a podium finish in the women's golf tournament. Yuka Saso scored a one-over 71 for joint second place at the start of women's golf while fencer Lawrence Everett Tan and swimmer Nicole Oliva failed to medal in their events on Tuesday. Jann Mari Nayre saw his medal bid in the 2018 Youth Olympic Games come to an end after dropping his match against Kanak Jha of the United States Tuesday. Jann Mari Nayre jumpstarted his campaign with a hard-earned win over Nicolas Burgos of Chile but lost to Austria's Maciej Kolodziejczyk in the second match. Massimo Costantini helped turn India table tennis around after Rio. With Costantini stepping down, the nation's top players are unsure if an Asian coach will be the right fit. In 2015, before she cracked the ITTF top 100, Egypt's Dina Meshref considered quitting table tennis. Now, at the age of 24, she's Africa's champion, and ranked 43 in the world. A three-time Olympian now in his fourth Asian Games, Sharath at 35, is something of an elder statesman in the national side and has been they key to them contending for medals at major tournaments. 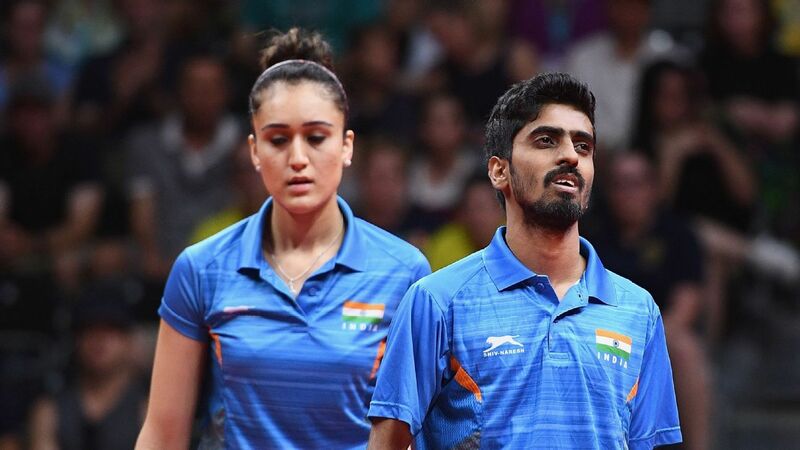 Sharath Kamal and Manika Batra continued their splendid form in 2018 by becoming the first Indian pair in history to medal in the table tennis mixed doubles event at the Asian Games. Day 11 of the 2018 Asian Games saw two golds for India, the first from Arpinder Singh in the triple jump followed by Swapna Barman in the heptathlon. There were two other medals too from the day. Here are all the updates as it happened. India reached the medal rounds of table tennis for the first time in Asian Games history by upsetting Japan in the quarter-finals. Having led India to their best finish in 20 years at the world team championships in Sweden, both Sathiyan Gnanasekaran and Sharath Kamal say Indian table tennis is on the rise and are setting far higher standards than in the past. Kanak Jha beat Nikhil Kumar in 30 minutes to become the first U.S. men's back-to-back table tennis champion since Timothy Wang in 2012-13. Lily Zhang defeated her Olympic teammate Jennifer Wu to win her fourth national singles crown. Kong Linghui, the coach for China's national women's table tennis team, has been suspended from the team in the wake of a lawsuit over alleged casino debts.